Celebrating the good news today outside the Moree Memorial Hall, Moree Plains Shire Council’s Economic and Community Development Manager Mark Connolly, left, Mayor Katrina Humphries, Northern Tablelands MP Adam Marshall, General Manager Lester Rodgers and Councillors George Chui and John Tramby. 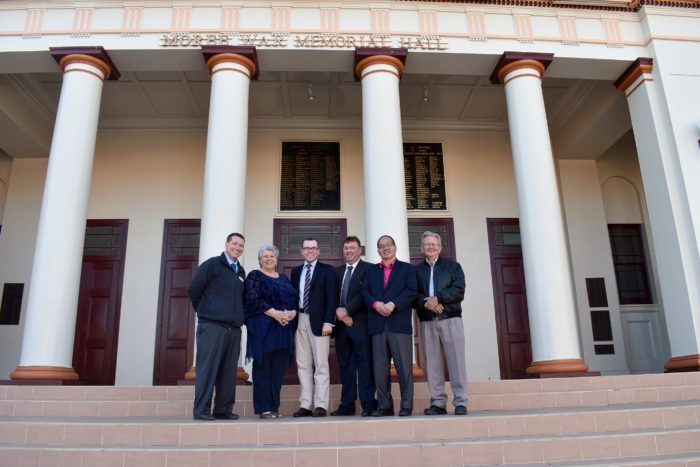 MOREE’S 95-year-old Memorial Hall is set to be overhauled thanks to a $2.4 million refurbishment project, which was given a shot in the arm today by Northern Tablelands MP Adam Marshall. Standing on the steps of the iconic town hall this morning, Mr Marshall announced the NSW Government would contribute $1.05 million to the proposed upgrades. The funding comes from the Regional Cultural Fund, established to drive growth in artistic, cultural and heritage infrastructure in country NSW. “This is fantastic news for Moree and I’m delighted that Moree Plains Shire Council’s proposal to upgrade and update the Moree Civic Precinct has been successful,” Mr Marshall said. “The Memorial Hall is an iconic building in Moree that was first established in 1923. It has stood the test of time and has been Moree’s cultural hub for 95 years – this funding will revamp the building and ensure it continues to play a pivotal role in Moree for another 95 years. “The Civic Precinct incorporates the Memorial Hall, the Banquet Hall and the Moree Plains Library and is the beating heart of the Moree CBD. It is home to the regions dramatic arts but is in desperate need of an upgrade to continue serving Moree’s needs into the future. “Schools, community groups, visiting shows all rely on the precinct but some of its infrastructure is outdated and disability access is all but impossible. Mr Marshall said the upgrade would install modern heating and cooling systems, resolve electrical issues, upgrade the lobby and breezeways, improve the lighting and stage infrastructure to meet modern theatrical requirements and audience expectations, allow for cosmetic improvements, provide for acoustic upgrades as well as install a lift within the Moree Community Library that will allow people in wheelchairs to access the Precinct. “All up this will be a $2.4 million redevelopment with council meeting the remainder of the costs,” Mr Marshall said. Mr Marshall said that this round of funding is only the beginning for the Precinct with Council flagging further development. “I know the Council is keen to upgrade the digital media capacity of the building as install luxury seating down the track. I’ll be keeping a close eye on this project and will do everything I can to help secure this facility as a state-of-the-art cultural facility for Moree,” he said.